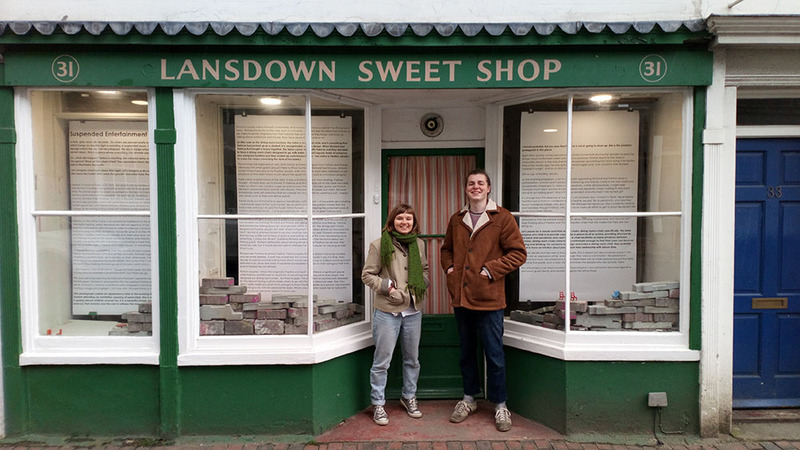 New work for SWEETSHOP by recent Brighton Graduates Lorna Ough and Benjamin Egan Clements take the idea of the shop windows – what can be seen on display and what is going on beyond, as a starting point for their installation. Lorna Ough has written a story about an anxious dinner party, as a way to think more about a Patrick Caulfield painting (currently on show at Towner Art Gallery). 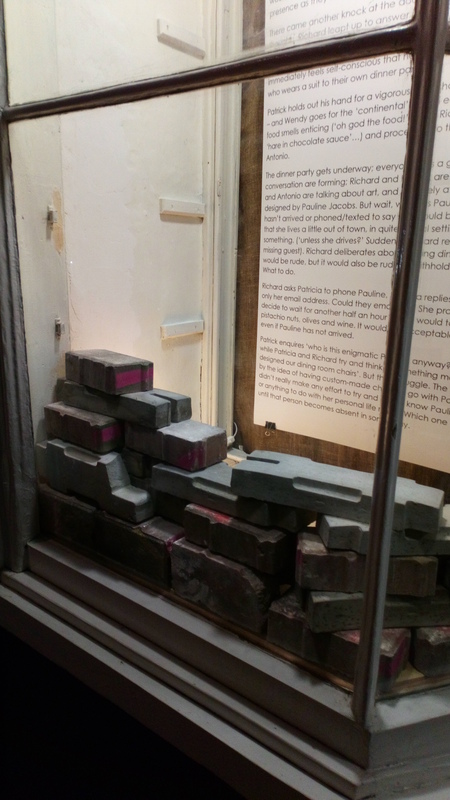 Benjamin has begun to stack his cast bricks to occupy the window spaces as obstructions, which from a distance suggest a time line or landscape. The combination of these artworks prevent you from looking at the text in a static way, interrupting the space. Much like the way the dinner guests in Lorna’s story are interrupted by the emptiness created by the absence of the character Pauline. 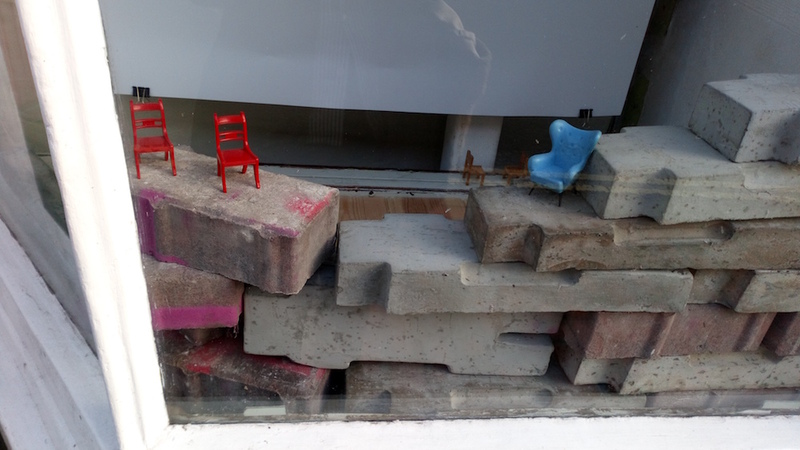 Let’s think about bricks and chairs – who makes and designs them? They are supportive objects that are designed to hold things up, but rarely take centre stage. In this instance the bricks and chairs become the main characters in a theatrical set which responds to a painting entitled Dining Recess by Patrick Caulfield. In Caulfield’s work there is a window through which the sky can be glimpsed – is it dawn or dusk? What time of day might you be viewing this piece? As you begin to read the story in the first window, you will gradually make your way from east to west where the story comes to an end (sets…). The terrain of the bricks mimics this habitual cycle. A dark, grey room sits desolate. Six chairs are placed neatly around an empty table above which hangs an electric light resembling a suspended moon. There is a small, high window through which the sky can be glimpsed. The sky is indigo which is slowly getting lighter: it is almost dawn. This is a place where everything has already played out. So…what did happen? Before everything was cleared away and wiped down, who occupied this space? Were all the chairs filled? The suspended moon light hangs down and glows, but fails to illuminate the room. Let’s imagine what took place that night. Let’s imagine a dinner party in this dining recess. Who were the hosts? Who were the guests? And what were their stories? Rewind 10 hours to take us to 7pm. Our guests are expected at half past. Our hosts Patricia and Richard Caulfield are preparing some food for their guests; tossing salad and chilling wine. This dinner party has been organised by Richard to impress his boss and potentially secure a promotion at the university he lectures at. Therefore, the pre-party anxiety is felt more by Richard than Patricia. Not only is Richard stressed about impressing his boss, Patrick, but he is also pre-occupied with some kind of jealousy or resentment towards Patricia’s only chosen guest: an artist friend Antonio. Patricia and Antonio studied together at The Royal College of Art during a time when art students could squat in 19th century town houses and when art schools were at the centre of the emerging punk scene. Whenever they got together, nostalgia was the order of the day and this made Richard silently furious. Patricia, on the other hand, was somewhat indifferent to the imminent gathering that they were both hosting, partly because she did not approve of her husband’s way of trying to score brownie points with his boss in order to attempt a promotion. Richard seemed to think that by buying 4 bottles of Patrick’s favourite wine (2 bottles that they would supposedly drink and then 2 bottles that would casually sit in their wine rack, so that it seemed like Richard and Patricia moved in the same circles as Patrick and Wendy, or whatever it was that Richard was going for with that one) and cooking a meal that Patrick mentioned off-hand a couple of weeks ago (‘Hare in chocolate sauce’ or something odd and risky-sounding). Of course Richard was fretting over this choice of main course, by cooking something that Patrick had mentioned off-hand at the university, Richard hoped that said meal would be something sophisticated, yet everyday so that, afterwards, Patrick could simply remark “Oh, this is one of my absolute favourite dishes, how funny that it would also be one of yours Richard”. Thus making Richard go up in his boss’s estimations. …but ‘hare in chocolate sauce’ would not have been Richard’s preferred main to cook for his boss who he wanted a promotion from, but there we go. The door bell rings piercing Richard and Patricia’s separate reveries. It’s Antonio. Antonio is the first guest. Richard is annoyed by this, he wanted Patrick and Wendy to be the first to arrive. Antonio is carrying a bottle of wine wrapped in brown paper and also appears to be holding a single photograph. (‘oh how arty’ Richard thinks to himself bitterly). Antonio quickly makes himself comfortable and immediately takes a seat at the dining room table. Richard thinks this a little rude, but I’m not really sure what else he expected Antonio to do. Patricia quickly brightens now that Antonio has arrived and they begin catching up, talking about exhibitions and movies they have recently seen and so on. This evening was organised at very short notice so therefore, apart from Patrick and Wendy, (obviously) the other guests are just there to fill up numbers. If Richard had his way, Antonio would not be there and as for Pauline Jacobs, well, the couple were fairly indifferent to her presence as they didn’t know much about her apart from her work as a furniture designer. There came another knock at the door. It was a rhythmic knock– how irritating, Patricia thought. Richard leapt up to answer it; Patricia and Antonio both sat at the table now and make no effort to be inclusive or get up and answer the door. Our next guests are Patrick (Richard’s esteemed boss) and his wife Wendy. They both look casual, but stylish. Richard immediately feels self-conscious that he’s made too much effort by wearing a suit…I mean, who wears a suit to their own dinner party? Patrick holds out his hand for a vigorous handshake with Richard – who’s palms are sweating – and Wendy goes for the ‘continental’ kiss on each cheek. They politely remark that the food smells enticing (‘oh god the food!’ thinks Richard, remembering the potential horror of ‘hare in chocolate sauce’…) and proceed into the dining room to greet Patricia and Antonio. The dinner party gets underway; everyone has a glass of wine in hand, and the pockets of conversation are forming; Richard and Patrick are talking academia and Wendy, Patricia and Antonio are talking about art, and precisely at this moment, the dining room chairs designed by Pauline Jacobs. But wait, where is Pauline? It has been almost an hour and she hasn’t arrived or phoned/texted to say she would be late…how odd. Richard remembers that she lives a little out of town, in quite a rural setting, maybe the trains are playing up or something. (‘unless she drives?’ Suddenly Richard realises how little he knows about our missing guest). Richard deliberates about serving dinner before Pauline has arrived, that would be rude, but it would also be rude to withhold the main course for too long as well. What to do. Richard asks Patricia to phone Pauline, Patricia replies that she doesn’t have her number, only her email address. Could they email her? She probably wouldn’t see it in time. They decide to wait for another half an hour which would take them up to 8.30pm surviving on just pistachio nuts, olives and wine. It would be acceptable for them to start eating by that time even if Pauline has not arrived. Patrick enquires ‘who is this enigmatic Pauline anyway?’ and there is a significant pause while Patricia and Richard try and think of something more to say other than simply ‘she designed our dining room chairs’. But they struggle. The pair were so excited and obsessed by the idea of having custom-made chairs to go with Patricia’s beloved table, that they didn’t really make any effort to try and get to know Pauline Jacobs as a person; her interests, or anything to do with her personal life really. Which one can often easily fail to notice this until that person becomes absent in some way. I should probably tell you now that Pauline is never going to show up. She is the phantom protagonist in this piece. Eight thirty quickly comes around and Richard (somewhat reluctantly) decides to serve the dinner. Much to Richard’s relief and obvious pleasure, Patrick reacts to the ‘hare in chocolate sauce’ in the way that Richard wanted; exclaiming that since trying it for the first time a few weeks ago, he was dying to have it again and ‘how uncanny that Richard cooked it tonight’ and so on and so forth. Still no sign of Pauling Jacobs. As the evening progresses, a bit of a rift starts appearing; Richard and Patrick deep in conversation, Antonio and Patricia still reminiscing and Wendy mostly in her own world and occasionally chipping in to various conversations, a little disinterestedly, I might add. However much each pocket of conversation was separate, it kept making its’ way back round to our missing guest. Who is Pauline Jacobs? And why hasn’t she turned up? Richard is also suddenly attracted to an image of Pauline that he has in his head…and he is annoyed by this! He wanted tonight to be about securing a promotion and now he can’t stop thinking about Pauline and these beautiful chairs that she made that they are now sitting on. Let’s pause for a minute and think about chairs; dining rooms chairs specifically. The basic purpose of a chair is to provide support for a person to sit or recline, providing structure for the back and sometimes arms and legs. A chair facilitates so many situations between humans. Dining room chairs need to be comfortable enough so that their users can focus on eating and drinking. For someone to design and make a dining room chair, they probably need to have an intuition about people and their relationship with leisure time. Pauline Jacobs must be one of those people. She is absent but also invasively present; the chairs are an expression of her, even though they were a commission. Her presence is physical but mute. Her presence is also multiple-there are six chairs placed around the table, and only five guests, so in a way, she outnumbers the people who are actually there. The one empty chair which would have been Pauline’s now somehow becomes figurative and each guest silently and secretly imagines her sitting there.